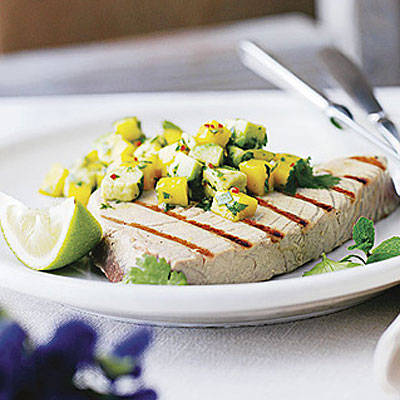 A salsa of avocado and juicy mangoes makes this simple fish dish a delicious treat. And it's ready in under 20 minutes. Place the mango, avocado, chilli, herbs, lime juice and zest in a bowl and season. Mix together and set the salsa aside. Meanwhile, place a griddle or frying pan over a high heat. Brush the tuna steaks with the oil and season. Place them on the griddle and cook for 1-1½ minutes on each side for rare, or 2 minutes on each side for medium. Serve with the salsa, lime wedges and a bag of Waitrose Red Butterhead Salad. The salsa can be prepared a few hours ahead. Simply place in a non-metallic bowl, cover with clingfilm and keep in the fridge until needed. It is best served at room temperature.